Summer overalls/jumpsuit for our youngest fashionistas with side seam pockets and a zipper fastener inserted in the center back seam. 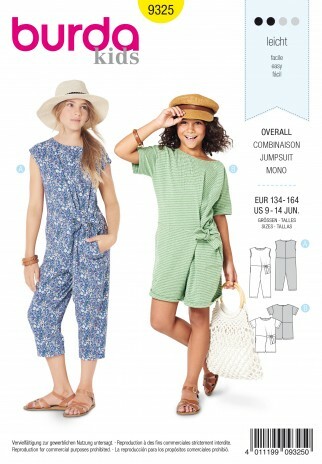 This pattern lets you choose between short or long legs, short sleeves or completely sleeveless. An interesting styling detail are the tie bands at the waist which give the garment its asymmetric shape.